The Muslim Rights Concern, MURIC, has reacted to moves by the Christian Association of Nigeria, CAN, to deploy 300 observers during the 2019 elections as well as certain subterranean manoeuvres in the political arena. MURIC said CAN was over-reaching itself, adding that monitoring elections in Nigeria has never been based on religious affiliation. MURIC said this in a statement signed by its director and founder, Professor Ishaq Akintola, and made available to the Media on Monday, where the organization advised CAN to give what belongs to Ceasar to Ceasar. MURIC further claimed that CAN’s observation of the election can never be neutral, adding that Christian clergies have openly exhorted their followers not to vote for Muslims. The Muslim rights group’s statement continues, “CAN is overreaching itself. The monitoring of elections in this country has never been based on religious affiliation. The last time we checked, no country in the whole wide world has been doing that. The avalanche of non-governmental organizations (NGOs) is more than enough as neutral observers. We advise CAN to give unto Ceasar what belongs to Ceasar (Mathew 22:21). “Come to think of it, how does CAN expect to guarantee its neutrality as an observer? Who doesn’t know what the reports of CAN’s observers will contain? It is very simple given the anti-Muslim threats and post-Christian comments of pastors in the past two years. Christian clergies have openly exhorted their followers not to vote for Muslims. 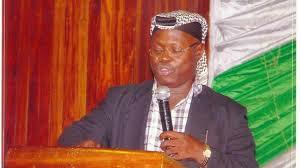 MURIC also accused CAN of seeking to impose Christian governors in all South Western states. “Our neighbours do not believe in sharing with others. They must take everything. To them the method does not matter. Fair or foul means mean the same to them. “Otherwise how does one explain CAN’s demand that INEC should declare Ademola Adeleke as the winner of Osun gubernatorial election when CAN is not unaware that Adeleke scored F9 parallel in WAEC and the police has a case of examination malpractice waiting for him? “What kind of governor will Adeleke be? What example can he give the youths of the State of Osun? Will he have the moral right to condemn students who engage in examination malpractice or cultism? “Adeleke will certainly desecrate the revered office of the governor. Or does CAN think dancing alone is enough as qualification for the post of governor? CAN wants to sacrifice excellence on the altar of mediocrity. Just because of religion? “How does a governor with such a low level of education appreciate the value of education in the state? How will he relate with professors and doctorate degree holders in his executive when no hospital has the cure for inferiority complex? “We like to place it on record that CAN is the one that often forces MURIC to engage it in polemics. We cannot keep quiet when CAN adopts an aggressive political agenda which is detrimental to the interest of Muslims. “MURIC has a moral obligation to defend the interest of Muslims. The atmosphere will be cleaner and safer if CAN will not seek to arrogate all political offices to Christians or make ridiculous demands like seeking to enthrone the least qualified citizen in a state as governor. “Can CAN deny that its leaders met the Oyo State governor about three weeks ago to demand that the next governor of the state must be a Christian? Was that also not CAN’s battle cry for the heart of Lagos in 2015? Today, Lagos, Ondo and Ekiti are ruled by Christian governors while Ogun, Osun and Oyo have Muslims as governors. That means Christians have three governors while Muslims also have three. But CAN is not satisfied. Its own idea of neighbourliness is to seize the whole South West. Our people say that the eagle that perches on a treetop does not know that those on the ground are watching it. “We know the rationale for CAN’s interest and we understand. Patronage becomes specially juicy, pecuniary benefits become more secretive and political appointments get more lopsided when its cronies are made governors. But should religion be the main criterion for choice of state governors? “We advise CAN to do away with its domineering complex. Religious leaders should allow the electorate to choose candidates with the right leadership qualities like vision, high-level intelligence, accessibility, credibility, integrity, probity and accountability. Any candidate who possesses these qualities should be the favourite of the electorate. It does not matter whether he is a Christian or a Muslim. Only thus can such candidates perform when they get into office. For the avoidance of doubt, MURIC is prepared to accept and support any Christian candidate who possesses the right qualities. “Let us pick candidates on the basis of what they are capable of doing and not on the basis of their religious affiliation. We must look for candidates who will eliminate corruption, improve infrastructure, provide job opportunities, care for retirees and senior citizens, diversify the economy, pursue a rigorous public health scheme, provide 24-hour power supply and turn the education sector into the pride of scholars. CAN should, therefore, stop making demands for Christians to be picked as gubernatorial candidates or presidents. It is parochial, myopic and counter-productive. “CAN should also realize the Utopian nature of the ‘Christians vote for Christians’ dogma. It is unrealistic in the Nigerian setting. For example, now, former Vice President Alhaji Atiku Abubakar and President Muhammadu Buhari have emerged as candidates of the two major political parties and both happen to be Muslims. How does that fit into the Christian agenda? “MURIC appeals to CAN to think Nigeria and to work towards emancipating the masses from the grip of the few wealthy, greedy and selfish citizens. How do we explain a situation where only 1% of the population arrogate to themselves 85% of the total wealth while the overwhelming 99% fight over just 15% of the resources? The hard fact is that Christians and Muslims are among the 1% superfluously rich while the 99% hoi polloi are also Christians and Muslims. “This is the area that should concern religious leaders. We should find solutions to poverty, illiteracy and disease. Christian and Muslim leaders should put their heads under the same thinking cap to find solution to corruption, insecurity and other problems plaguing the nation. We should think less of the religion of the president or the governor because that is often done for personal aggrandisement and other narrow ends. “A political culture based on religious affiliation cannot give us good roads, efficient electricity supply, qualitative education, reliable public health system, etc. It can only give the religious leaders and their families more private jets, more private universities and more contracts while the followers continue to wallow in abject poverty. Directing our followers to focus on religious affiliation alone is symptomatic of acute desertification of patriotism. “We appeal to well-meaning Nigerians to caution CAN leadership on its political misadventures. Nigerian Muslims and their leaders are not known for making explosive or provocative statements. Neither are they known for hobnobbing with people in the corridor of power. CAN has had a field day in that respect for a very long time. It can no longer enjoy that monopoly. CAN should know when the ovation is loudest. The world is now a tiny village and nothing is hidden any longer. “We confuse Nigerians when Christian leaders speak and Muslim leaders react or vice versa. It stokes the fire of religious crisis. It also confuses and embarrasses political leaders. A more mature way is for us to follow the path of dialogue based on mutual respect. We need to interface frequently at both high and grassroots levels. Leaders from both divides should invite one another to their homes and allow Nigerians to see how they relate cordially. This will boost peaceful coexistence.